A Dutch police officer carries the following weapons: a pistol, pepperspray, a stick, tear gas, and handcuffs. The official term for the stick is "wapenstok" – literally: weapon stick – but often the more informal "knuppel" is used. In general, "knuppel" is a round stick meant to swing at something (or someone…). The related verb is "(neer)knuppelen": to club/beat (down), to bludgeon. In the Netherlands, the police are allowed to use their weapons for defense only, except for the stick. – "De politieagent moest zijn knuppel gebruiken tegen de agressieve supporter." – "Een aantal demonstranten werd neergeknuppeld door de politie." – "Bij nachtelijke wegcontroles vindt de politie altijd veel messen en honkbalknuppels." – "Een knuppel in het hoenderhok gooien": (literally: to throw the stick in the henhouse) to put the cat among the pigeons / to create a stir / chaos. During international sports events, Dutch supporters like to bring along all kinds of crazy attributes to help them support the Dutch team. This is a picture of an inflatable baseball bat. The text reads: "Hup Holland" which translates to "Go Holland". The strange thing is that the word "hup" to cheer somebody on is only used in this alliteration. In all other circumstances it would be very archaic (however, it can be used to encourage somebody to hurry up a bit). In this context, "knuppel" is only used for men. The female equivalent would be "doos" (the very first DWOTD 🙂 ). 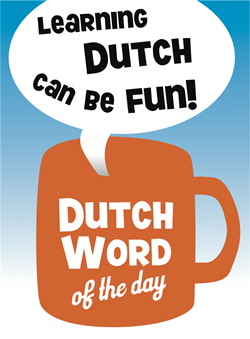 – "<vrouw:> ‘Wat ben jij een slome knuppel!’ <man:> ‘Nou, ik vind jou ook een saaie doos!’ "
This entry was posted in Dutch word of the day, DWOTD 1.0, Vocabulary Intermediate by Dutch Gurus. Bookmark the permalink.